It is not a secret anymore. Check out who made The 2018 Inc. 5000!! Columbus, OH - Architectural firm pH7 Architects today announced that C. Bradley Pauling, AIA, NCARB, an Architect in the Firm's practice, has been named to the Firm's partnership, effective January 1, 2018. "Brad has been an integral part of our work, serving clients as a Senior Project Manager and Designer, in Columbus for projects throughout the country. We are proud to welcome him as a partner," said Michael Healy, AIA, a founding partner of the twelve-year old architectural firm located in the Arena District. "We look forward to Brad’s continued contributions with our staff as Studio Director and his continued involvement with our growing list of clients,” said Daniel Pardi, AIA, also a founding partner at pH7 Architects. Working in the capacity of Senior Project Manager, Mr. Pauling has been serving clients across the country with recent projects in Parma, OH, Louisville, KY and Upper Arlington, OH. In his new role as Studio Director, Mr. Pauling will focus on mentoring pH7’s professional staff and establishing “Best Practices” as the firm continues to provide design services across the full spectrum of the Senior Housing market. He has significant experience in both the design aesthetic and technical knowledge needed for complex senior housing and chronic-care facilities. Mr. Pauling earned both his undergraduate and graduate degrees from Kent State University. pH7 Architects is a Columbus, Ohio-based architectural firm with twenty staff all located in the Nationwide Boulevard office on the Western edge of Columbus, Ohio’s Arena District. The Firm is distinguished by a commitment to the design of environments for seniors with an on-going pledge to collaboration and partnership with its clients and consulting partners. Partnering with The Jones Studio and EDGE Group, pH7 has completed Schematic Designs for the proposed new $37.0M expansion at First Community Village - an NCR community located in Upper Arlington, OH. Click here to see more about this transformative project. pH7 architects is proud to be a part of the Maplewood at Cuyahoga Falls and Maplewood at Twinsburg Senior Living Community projects. 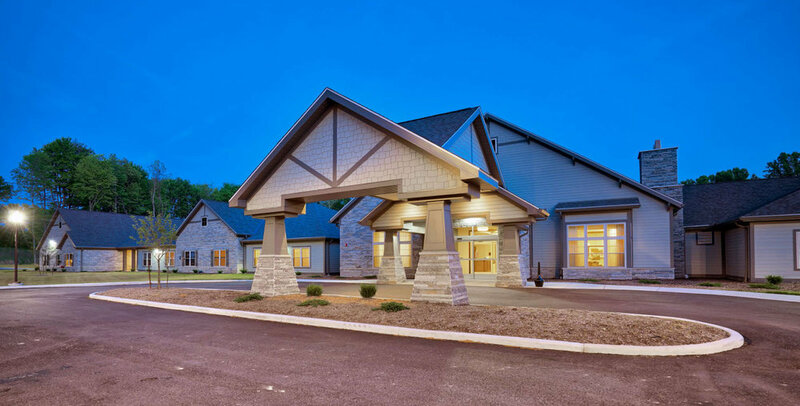 From design to execution, form to function, we worked with Maplewood Senior Living to ensure that their vision became reality. Click on the photo below to see these beautiful projects and the facilities and services they offer to residents. pH7 architects was pleased to provide a Senior Project internship opportunity to Colin McAllister, a student at Worthington Kilbourne High School in Worthington, OH. The Senior Project allows students to exit the classroom the last four weeks of their senior year to engage in a real-world experience of an internship. Seniors must get their projects approved, create a display and presentation, and defend their project in front of an evaluation committee. The Senior Project is taken so seriously that they must pass the evaluation in order to graduate. Colin has worked closely with his Project Mentor, Daniel Pardi, Principal at pH7. He also spent time working with pH7 associates on AutoCAD and Revit design projects, participated in site visits, and in project meetings with owners and contractors. Colin’s enthusiasm for and interest in the projects assigned was apparent in his attitude and performance. The future looks bright for this young man. pH7 architects is proud to be a part of the team that built The Harcum Fitness & Aquatic Center at Wesley Ridge. Click here to see this beautiful facility for yourself. pH7 is looking to expand its staff. We are looking for Project Managers, Project Coordinators and production support team members. We practice in a variety of commercial work space and housing markets with a specialization in the senior housing segment. If you are creative, energetic and self-directed send your resume or contact Daniel Pardi, AIA (dpardi@ph7architects.com) or Michael Healy, AIA (mhealy@ph7architects.com) regarding your interest in becoming part of our team.